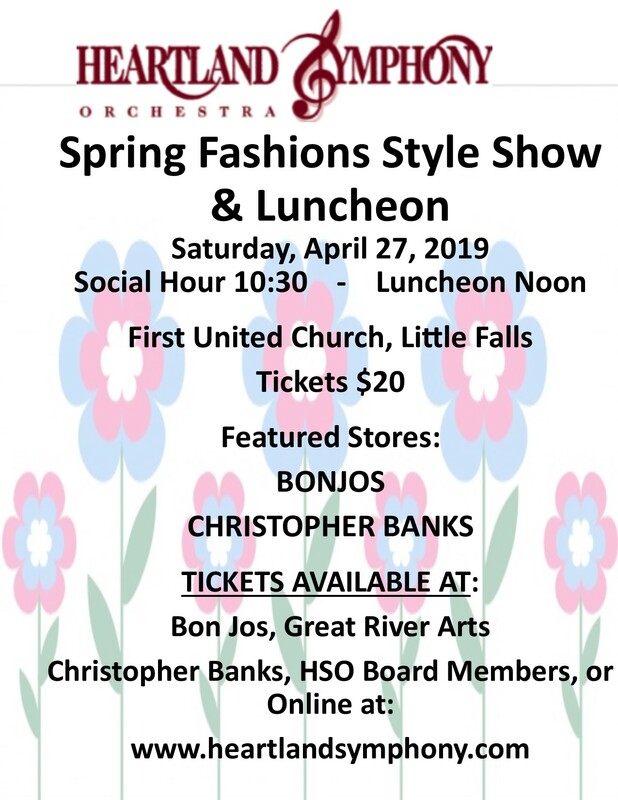 The 14th annual Heartland Symphony Orchestra (HSO) benefit fundraiser, “Spring Fashions Style Show and Luncheon”, will be held Saturday, April 27, 2019 at the First United Church in Little Falls. Bon Jos of Little Falls and Christopher Banks from Brainerd will offer their spring and summer fashions for the style show. Baskets will be offered for bid during a silent auction and door prizes will be awarded. Bidding on the silent auction items takes place during the social hour. Tickets for the luncheon cost $20 and may be purchased online, at Bon Jos and Great River Arts in Little Falls, Christopher Banks in Brainerd or from an HSO board member. People may call Collette at (218) 829-4809 or Echo at (320) 632-4462. For more information call (800) 826-1997. Saturday, April 27, 2019 | 10:30 a.m.
View the Spring Fashions Style Show and Luncheon poster.